The most basic thing in search engine optimization (SEO) a website is a keyword. Keywords can determine the amount of blog or web traffic that comes from search engines. Keyword also is the most important thing in implementing basic SEO tips. Therefore, choosing the right keywords is important to get maximum results. Keyword is the key to SEO (Search Engine Optimization). The keywords you choose will play a big role in determining the amount of traffic or visitors coming from search engines, like Google. For maximum results, do a research first in finding the right keywords. The selected keywords should be the most searched keywords in search engines. If you choose the wrong keyword, this will certainly result in lonely visitors. But, if the chosen keyword is right, more visitors will come from search engines. An article or article should have good keywords to support its ranking in search engines. One of the tips in choosing it is to use specific keywords or can be called long tail keywords instead of using short keywords that have a high level of competition. This is mainly used for new blogs or websites. The advantage gained by using long tail keywords is that it can reduce competition for a keyword in search engines. Thus, the chances of the emergence of articles on search engines will become even greater. In addition, information seekers on search engines usually also use several words to search. Previously, register with the search engine first the website that was owned, especially google. Because currently the Google search engine is the most popular compared to other search engines. For blogger / blogspot users there is no need to register a website with Google. Blogger will automatically register your blog on google search engines if you do not change the default settings. For those who want to learn free SEO, first master the basic SEO techniques. Below will be explained in more detail about the three things above. The title of the page is a sentence in the title tag and located between the head tags. This title will be used as the title of the tab of a page that is opened in the web browser. In addition, this title tag will also be read by the search engine as a web title in the search results. See more about the placement of title tags in HTML files. Title tags are one of the most important components in onpage optimization. Because this tag will show the search engine what topics are being discussed in the text and will appear in the first line before the description. The reader will also first see the title of the article rather than its contents to choose which website to open in the search results. Therefore, do not make the title of an article carelessly. One of the things that must be done is to add the selected keywords in the page title. Also for optimal results, place the keyword at the beginning of the page title. Because the more in front of the keyword is placed, the better. One mistake that is often done is to determine the brand or homepage title at the beginning of the article title. If you are a blogspot user and use the default template, the brand will be created at the beginning of the title of each article. In SEO tips, this is not recommended. So for better results put the brand at the end of the title. To be able to make a good article title in the eyes of readers and search engines, you must know the tips. The following tips need to be known in making an article title. The title should be made describing the contents of the text from a page. Based on the SEO starter guide created by Google, it is said to avoid creating titles that are not related to the content / content of the page. In addition, also avoid making default or unclear titles such as "Untitled", "New Page 1". If your page is in the top ten Google searches with certain keywords, then chances are that the page will be flooded by visitors, especially if it ranks first. However, it would be better if the title of the article was made fishing. Maybe visitors will prefer articles with titles like this and the possibility of being clicked will be greater. It might even be that your article will be clicked more than the article in the higher order but has a mediocre title. Descriptions are a few sentences that are snippets of a writing. Important descriptions to add to each page because Google might use it as a snippet or snippet in search results. Even though Google can make its own snippet to show relevant sentences. Just like the title, also add keywords to the beginning of the description. Then how do I add a description? Descriptions are made using the description meta tag on the template. This meta tag code will look like this. Google can also use descriptions from the Open Directory Project (ODP) if your website is listed there. You can read it in an article from Google about snippets. Use the following meta tags to prevent all search engines from using data from ODP as page descriptions. If you only want to prevent Google from using a description of ODP, use the following meta tag. According to Google through Webmaster Central Blog, meta descriptions have no effect on the position of the website in search engines, but can improve clickthrough. However, indirectly the meta description will also affect ranking on search engines. Because clickthrough has an impact on search engine search results pages (SERP). Below will be explained about some basic SEO tips in making a description of an article. The same as how to create a title, the description must also be made according to the article. Make the right description to describe the contents of the writing. Don't make a description that has no connection with the content. In making a description, don't just enter keywords into it. Because not only search engines, this description will also be read by information seekers. So for the convenience of the reader make a quality description, not just filled with keywords. The description should also be made to lure visitors to click on it. Because in addition to the title, the description may also be seen by the reader as a consideration to determine the website to be opened. Create a unique or different title tag and meta description in each article. Besides being used in the title and description, keywords are also used in the contents of the page. You can repeat the keyword several times to indicate the keyword of an article. With a note, the repetition of keywords is not done excessively. Do repetitions with logical sentences. Don't carelessly add keywords if that's not needed in the sentence. Then, what about keyword density? Keyword density or the density of a keyword on a page has historically had an effect on SEO. But now keyword density no longer has a role in Search Engine Optimization. Most importantly, add keywords naturally. Keyword repetition is better by using word variations, which are more specific keywords, rather than just repeating the exact same keywords. By having many variations of keywords, the chances of articles appearing in search engines will be even greater. One of the basic SEO techniques that is important enough is about where the keywords are placed. Then how to put a good keyword for optimization? There are some places to keep in mind for putting keywords in it. Among these are the following. This heading tag is used to make a page structured by using the main title and sub-subtitles. The heading tag should be made sequentially, not indiscriminately. That means no heading tag jumps to an undesirable heading. Also add keywords to this tag. Google would prefer a web page like this. The URL should be made not too long. A shorter URL will be better. Also use keywords in creating URLs. Add keywords to the anchor text from the link. Avoid making text links with words that have nothing to do with the intended page, for example "click here". The added links can be internal links or external links. Both types of links if used correctly can also help website ranking in search engines. Alt tags will be seen by the reader as text in the image if the web browser cannot open it. For that, make text in the alt tag that can describe the image. This tag will also help search engines find images on a website with certain keywords in image search. It's best to use keywords effectively in paragraphs without doing it excessively. That's it basic SEO tips you need to know about doing search engine optimization. The three basic tips above are SEO onpage tips. 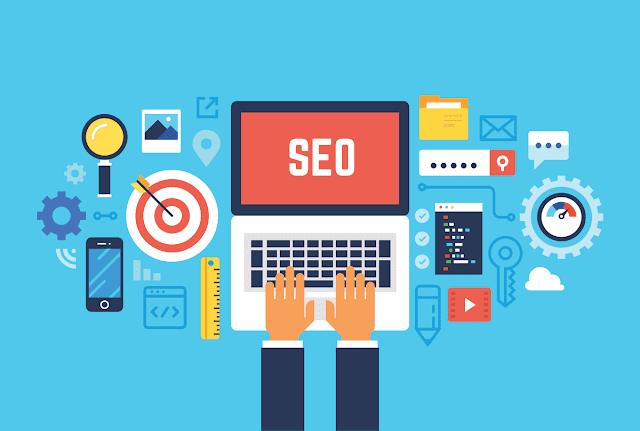 Hopefully these tips can help you in learning SEO for free.